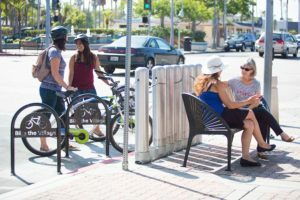 Every three years, SANDAG releases a Call for Projects to incentivize projects that promote smart growth and active transportation. 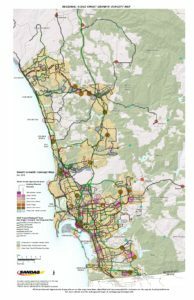 The money for the grant programs comes from two sources: TransNet, the regional half-cent sales tax for transportation approved by San Diego County voters, which sets aside 2 percent of annual revenues for each grant program; and funds distributed by the state under the California Transportation Development Act. 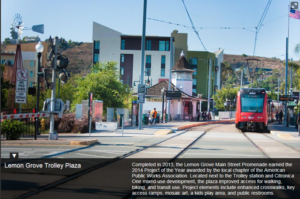 In March, SANDAG called on local jurisdictions to submit applications for more than $30 million in competitive grants available under the fourth cycle of the TransNet Smart Growth Incentive Program (SGIP) and Active Transportation Grant Program (ATGP). $27 million in smart growth funds and $3.6 million in active transportation funds were available. For the first time, up to $1 million from the smart growth funds were available for local jurisdictions to complete Climate Action Plans and Complete Streets Policies. In May, July, and October 2018, the Board approved the funding awards. 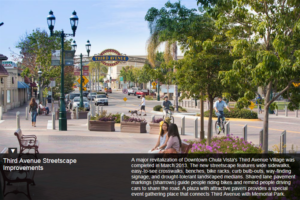 The TransNet Smart Growth grants help pay for efforts to implement public infrastructure projects that facilitate compact, mixed-use, transit-oriented development, as well as increasing housing and transportation choices in Smart Growth Opportunity Areas on the SANDAG Smart Growth Concept Map. The Smart Growth Concept Map illustrates the location of existing, planned, and potential smart growth areas, and serves as the land use element of San Diego Forward: The Regional Plan, showing where local jurisdictions are planning for smart growth, and where SANDAG is planning for higher-frequency transit services. The map contains more than 200 locations in seven smart growth categories. The seven smart growth “place types” include: the Metropolitan Center, Urban Centers, Town Centers, Community Centers, Rural Villages, Mixed Use Transit Corridors, and Special Use Centers, reflecting the notion that smart growth is not a “one-size-fits-all” concept. The map also shows the habitat conservation areas in the region, which often receive funding from the TransNet Environmental Mitigation Program. In this fourth funding cycle, the TransNet SGIP awarded more than $27 million to 23 projects (11 capital projects and 12 planning grants). Those projects will leverage over $18 million in matching funds. 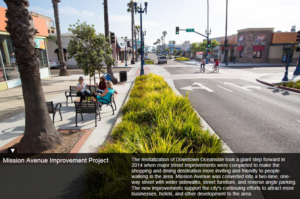 Roosevelt Avenue in National City and Paseo Santa Fe in Vista are two examples of areas which will receive major streetscape improvements to enhance multi-modal options, such as enhanced sidewalks, landscaping, parking, lighting, and signage. The projects will enhance transportation options, as well as improve safety and accessibility in the neighborhoods. The City of El Cajon received $150,000 for a Climate Action Plan. 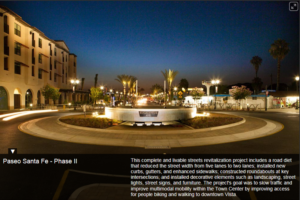 No jurisdictions submitted applications for complete streets funding. The TransNet Active Transportation Grants fund efforts to increase opportunities for walking and biking, and to implement traffic calming measures throughout the region, such as enhancing bike parking facilities, constructing buffered bike lanes and landscape medians, and planning for safer pedestrian pathways and bike routes. These projects help provide healthier transportation options, address traffic congestion, improve air quality, and improve public health. The fourth cycle included $3.6 million awarded to 15 projects (7 capital projects and 8 non-capital projects) under the TransNet Active Transportation Grant Program. The projects receiving funding will leverage approximately $2 million in local funds. For additional details about the fourth cycle of grant funds, visit sandag.org/cycle4grants. Also, check out successful grant-funded projects on the Keep San Diego Moving interactive story map. The next cycle of grant funding will be available in approximately 3 years… Stayed tuned until 2021.